Posted on May 29, 2018 at 5:22 am. The SOLs resume today with 7th graders on all teams taking the Math exam. Here’s a look at the testing schedule for May 29th…. 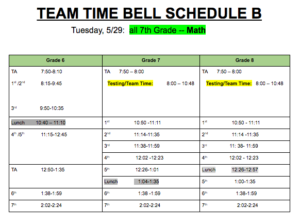 We will be following “Team Time Bell Schedule B.” While the 7th graders are testing from 8 to 10:48 a.m. — 8th graders will go to Team Time, and 6th graders will follow the adjusted ‘B’ schedule beginning at 8:15. Testing locations are listed on the call-board by the cafeteria, or you can check with your TA teacher. A few things to remember about testing…. When you arrive at your testing location, students should WAIT OUTSIDE for the examiner to check you in. Again, do NOT take your seat until the examiner has taken attendance. And test-takers may ONLY bring the following items: your fully-charged iPad, a pencil or pen, a book to read, and earbuds ONLY if you have an approved audio accommodation for the test. You may NOT bring: backpacks or cinch sacks; any other electronic devises such as phones, watches, game consoles and the like; nor any water or snacks. And of course, there is zero tolerance for CHEATING. And for all those students who are NOT testing today — please remember to be quiet and respectful in the halls. Teachers will be monitoring the hallways to ensure that there are no disruptions. Any other questions or concerns? Check with your teachers or grade level counselors. Good luck on your SOL, 8th graders! Did you get a good breakfast today? On EVERY scheduled SOL testing day, the WMS cafeteria will be offering a FREE BREAKFAST to all students, from 7:25 to 7:50 a.m. It’s a FACT that a healthy breakfast fuels both your body AND your mind. So give yourself the best chance for success, and EAT YOUR BREAKFAST!! The WMS Library will be CLOSED today during SOL testing hours. But it WILL be open after school. So be sure to stop by this afternoon and either get yourself something good to read — or better yet, RETURN YOUR OVERDUE LIBRARY BOOKS! And speaking of Wolf Pack Pride: WMS Spirit Shirts are going on sale for just 10-dollars each — TODAY after school in the new School Store. Grade-level shirts are also still available for 18-dollars. So come and get your WMS Spirit Wear, and Be a Part of the Pride! The WMS Kindness Club will be meeting TODAY during ASP 1 in room 134. There’s a LOT of work to be done on the end-of-the-year school project, so EVERYONE is encouraged to attend — both old members and new. See Mr. Johnson, Ms. Schaefer or Ms. Zeller with any questions. And finally today, it’s time for another Mindful Moment — to help us get centered and focused as we begin our day. So let’s just take a moment… and BREATHE.